This is a Big Daddy Flying Model Rocket from Estes. It's a skill level 2 item recommended for ages 10 and up. Retail $34.99 SAVE 23% ! "Love the Look of this Rocket"
Through the tube fin construction. Flights to 900 feet (274m). Also included are a die cut centering ring card, two die cut balsa fin sheets, and a decal sheet. Clear instructions and a one year warranty. I have built several of these kits and they are awesome! The kit goes together more like a mid-power kit than a low-power model rocket. The fins are slotted through the body tube wall and attach to the engine tube for extra strength. The giant 3 inch nose cone is very thick and over-all the design is very strong. I do recommend the Estes E12 over the E9 (the E9 REALLY CHUGS off the launch pad and if your lunch rod is not exactly vertical you risk a lawn dart!) and always use the shortest delays possible! I modified mine with new laminated balsa fins to look like a fatter version of the old Estes Goblin - Flies well and looks good! 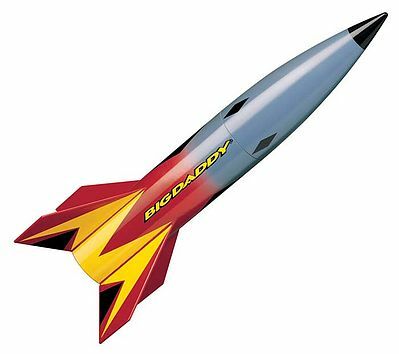 The Big Daddy kit is a great introduction into the world of more powerful rockets. The 24mm motor mount allows the use of everything from Estes C, D and E black powder motors to 24mm reloadable motors of E, F and G motors. One thing Estes did to allow for this extra power is use through the wall (TTW) fin construction. With the root of the fins glued to the motor tube you get a very strong rocket capable of withstanding higher power motors. I did deviate from the instructions in a couple of areas. First, instead of the kit shock cord I used a length of Kevlar cord and 1/4 flat elastic. The Kevlar was tied around the motor mount below the forward centering ring and run through a small notch on the outer edge. I cut the Kevlar so that it ended just inside the body tube when tied to 6&apos; of elastic. This technique is common in mid- and high-power rocket construction. Secondly, I didn&apos;t glue the aft centering ring to the motor mount until after the fins were glued in. It was on the motor mount tube while installing the fins, just not glued down. This allowed me to remove it after the fins dried so that internal fillets could be put on the fin-to-motor mount joint and where the fins meet the body tube on the inside. Doing this greatly strengthens the rocket at the point where it takes the most stress. Once the fillets were in I glued the rear centering ring in place. Paint is black and red rattle can with decals from an aftermarket supplier. One caution is to be very careful how much paint you apply. Due to the short length of this rocket it is easy to shift the center of gravity rearward with too much paint or glue. Doing so can cause stability issues if you aren&apos;t careful. If you do end up cutting it a bit close weight can always be added to the nose to move the CG forward again. I recommend staying with the higher end of the recommended motors for this rocket. You need a motor that will get it off the rod with sufficient speed for stability, and also the bigger motors are just more fun! Estes E impulse motors and Aerotech reloadables rule for this bird! Everyone needs a Big Daddy. Fun build. Flies great. I&apos;m on my second and thinking about my third... I would highly recommend substituting the stock shock cord for a Kevlar leader with an elastic shock cord. One of the other reviewers also recommended on installing the rear centering ring after gluing the fins and added fillets to the motor housing, which is a good idea. The instructions also do not add much for gluing in the rear centering ring to the BT. I&apos;d recommend adding a nice fillet there as well. Use only Estes products to launch this rocket. See tips for flying rocket within instructions.